Review by AllTheBestFights.com: 2018-06-16, pretty good fight with a spectacular finish: Cristian Mijares vs Wilfredo Vazquez Jr is close to get four stars! The former Wbc, Wba and Ibf super-Flw champion Cristian Mijares entered this fight with a professional record of 59-8-2 (27 knockouts) and he is ranked as the No.15 super flyweight in the world. ‘El Diamante’ Mijares suffered his last defeat when he faced Leo Santa Cruz in 2014 (Santa Cruz vs Mijares), since then he has won ten consecutive bouts beating Rafael Hernandez (Mijares vs Hernandez), Jesus Arevalo (Cristian Mijares vs Jesus Arevalo) and Fernando David Saucedo in his last three (Cristian Mijares vs Fernando David Saucedo). His opponent, the former Wbo super-Bw champion Wilfredo Vazquez Jr, has a record of 24-7-1 (19 KOs=79%) but he is not ranked as he hasn’t fought since October 29, 2016 when he was defeated by Juan Manuel Lopez (Juan Manuel Lopez vs Wilfredo Vazquez Jr); before this bout he had also lost to Fernando Vargas and Rafael Rivera. 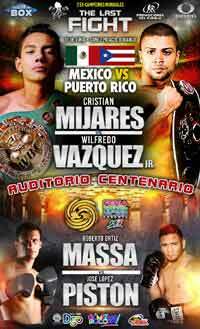 Mijares vs Vazquez is the main event of the evening. Watch the video and rate this fight!